As part of the southeastern United States SPARROW (SPAtially Referenced Regressions On Watershed attributes) water-quality model implementation, the U.S. Geological Survey created a dataset to characterize the contribution of phosphorus to streams from weathering and erosion of surficial geologic materials. SPARROW provides estimates of total nitrogen and phosphorus loads in surface waters from point and nonpoint sources. The characterization of the contribution of phosphorus from geologic materials is important to help separate the effects of natural or background sources of phosphorus from anthropogenic sources of phosphorus, such as municipal wastewater or agricultural practices. The potential of a watershed to contribute phosphorus from naturally occurring geologic materials to streams was characterized by using geochemical data from bed-sediment samples collected from first-order streams in relatively undisturbed watersheds as part of the multiyear U.S. Geological Survey National Geochemical Survey. The spatial pattern of bed-sediment phosphorus concentration is offered as a tool to represent the best available information at the regional scale. One issue may weaken the use of bed-sediment phosphorus concentration as a surrogate for the potential for geologic materials in the watershed to contribute to instream levels of phosphorus—an unknown part of the variability in bed-sediment phosphorus concentration may be due to the rates of net deposition and processing of phosphorus in the streambed rather than to variability in the potential of the watershed's geologic materials to contribute phosphorus to the stream. Two additional datasets were created to represent the potential of a watershed to contribute phosphorus from geologic materials disturbed by mining activities from active mines and inactive mines. 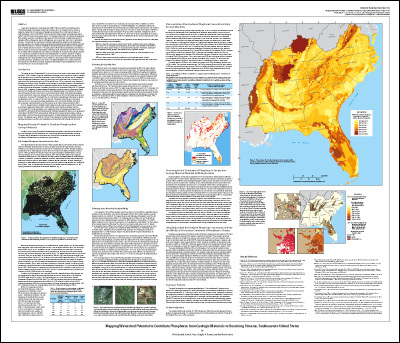 Terziotti, Silvia, Hoos, A.B., Harned, D.A., and Garcia, A.M., 2010, Mapping watershed potential to contribute phosphorus from geologic materials to receiving streams, southeastern United States: U.S. Geological Survey Scientific Investigations Map 3102, 1 sheet.